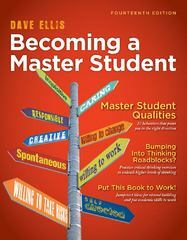 Becoming a Master Student (Textbook-Specific Csfi) 14 Edition The fourteenth edition of the bestselling BECOMING A MASTER STUDENT continues to lead the way in meeting the changing needs of today's first-year users. Through interactive journaling, a motivational writing style, and hands-on activities that users can apply right away, this book helps users succeed in college and in life. Tools like the Discovery Wheel, Discovery and Intention Journal, Power Process articles, Master Student Profiles, and the Kolb Learning Style Inventory (LSI) deepen users' knowledge of themselves and the world around them. In this latest edition, users will discover that study skills are really life skills with the renewed emphasis on the Master Student Qualities throughout the book. Users will be challenged to apply the Master Student Qualities to new Practicing Critical Thinking exercises and planning for a career.